RSS reader with smart sorting. Is there a better alternative to CleverFeed? Is CleverFeed really the best app in Newsreaders category? Will CleverFeed work good on macOS 10.13.4? CleverFeed is the smart reader for your Google Reader subscriptions. It will sort the news in a new and smart way: according to your taste and preferences. 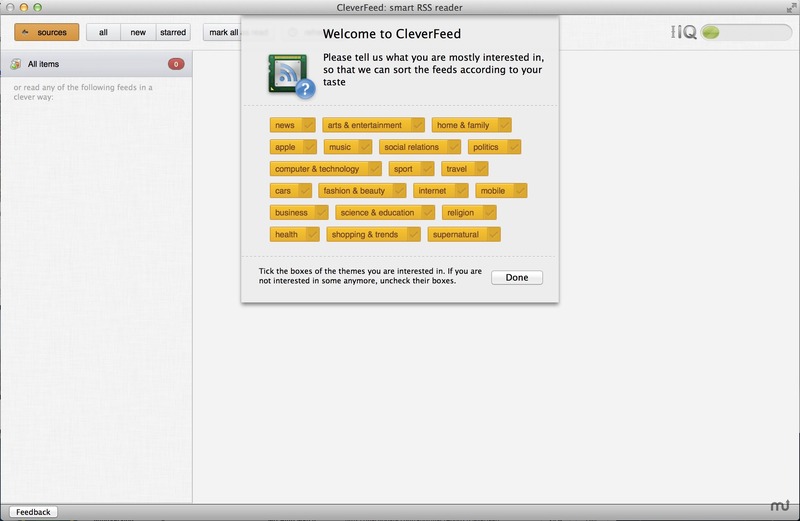 CleverFeed makes your Google Reader experience smarter. It lets you rank the RSS posts and learns what's interesting to you. Use the Thumb button to like or dislike the post. The more news you rank, the more your feed will be generated in future. As you mark, Clever Meter shows how smart CleverFeed thinks it is. The articles containing the same words or phrases will be shown in the first place. The coolest thing about CleverFeed is reading only those posts that interest you. Got hundreds of news items every day? Use CleverFeed to filter them the smart way.